Material - Solid wood, surface with waterproof and damp proof processin. Unframed and no glass face as the cover. Dimension - 11.8 x 15.7inches/30 x 40cm. Powered by 1 x AA Battery(Not Included). WARM NOTICE: The battery MUST be Carbon Zinc Battery to ensure properly work. 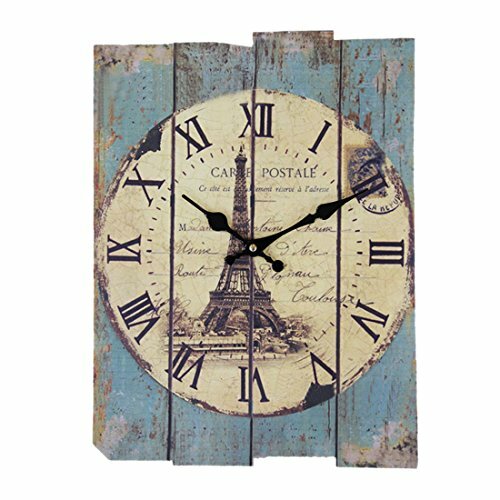 Attractive design - Large and bold Roman Numeral Design, try to hanging it in your wall to enjoy a vintage display on the wall with fashion pattern available, it's best decoration for you. Vintage Country Style Design - Retro looking will decorate any space; try hanging it in your kitchen for a vivid addition or place it in your home office to inspire an vintage atmosphere. Unique home decorative - Beautifully detailed and carefully crafted to inspire an vintage atmosphere, perfect to decorative your kitchen, bedroom, living room, office, or conference room etc.